Marine Contracting announce the successful towing of LLOG Exploration’s Delta House Floating Production Semi-Submersible to its’ operating site in the Gulf of Mexico’s Mississippi Canyon 254 field. The successful execution builds on the Gulf of Mexico track record of Marine Contracting’s parent company, Global Maritime, who has successfully supported the towing of Thunderhorse, Atlantis, Independence Hub and Who Dat. 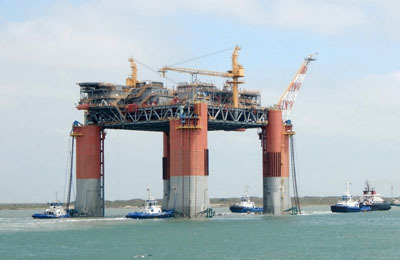 The Delta House semi-submersible move project, originally awarded to American Global Maritime, was led by Captain Jeet Kar who heads Marine Contracting Houston and involved detailed engineering and planning for the development of tow manual procedures and material specifications. Other activities included the vetting and approving of vessels, the procuring of towing equipment, and the coordination of activities with all parties and regulatory authorities, such as the US Coast Guard and Harbour Authorities, fabrication yard personnel and Tow Master services.